Download a printable marriage certificate. 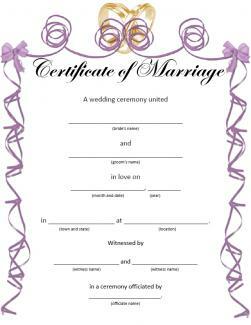 A printed wedding certificate is not a valid marriage license, but making printable certificates can be a fun way to show people how you appreciate them. Download one or more of the original certificates below to thank your family, bridal party members, guests, and those who played a special role in your relationship. You can download any of the printable certificates provided here simply by clicking the image or caption. Each document will open as an editable PDF document in Adobe Reader that you can customize, save and print. Download a certificate of attendance. Download a bridal party certificate. Download a certificate for special guests. Use just-for-fun certificates throughout your wedding activities. For example, you can print a fake marriage license to use for a variety of purposes. Place one into a photograph frame and give to the bride and groom. Use it on a display table at an engagement party or bridal shower. Use it as an opening page of a wedding photo album or scrapbook. Laminate them and use as placemats at your wedding reception dinner. Make coloring page style certificates and place with crayons in bags to keep children occupied during the event. Use a blank wedding themed certificate on the sign-in table instead of a guest book. Create a vow renewal certificate to present to couples who are re-stating their commitment. 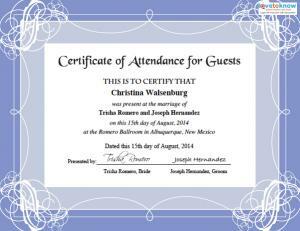 There are a other places where you can find certificate templates appropriate for weddings. One site to visit is FreePrintableCertificates.net. Choose from a number of different marriage certificates, including commitment and renewal of vow certificates. The originals are free, or download a customizable one for only five dollars. Visit Certificate Street to find a selection of wedding theme templates. You can download watermarked PDF documents free, while versions without the watermark are 99 cents each. Designs include hearts and birds, wedding rings, and a cartoon-style bride/groom. 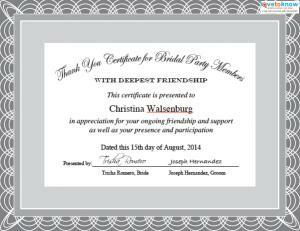 Use the templates discussed above to create a special certificate for a wedding day. Remember to print using quality paper and appropriate printer settings for best results.